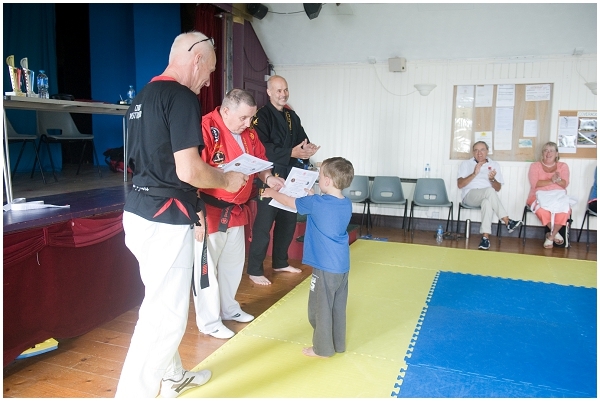 It was a sunny week in August 2016, when the sleepy Cornish fishing village of Coverack unknowingly hosted some of the worlds greatest martial artists! 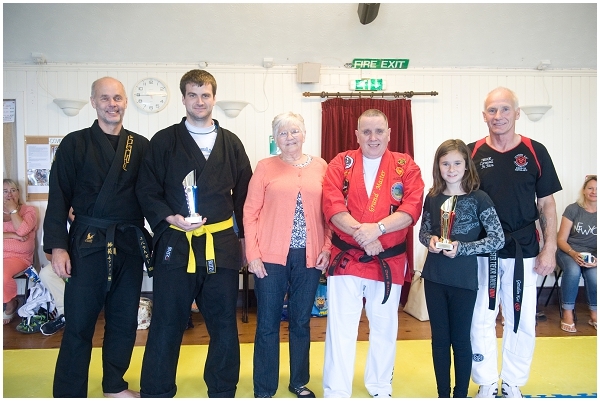 Coverack Ju Jitsu Master Trevor Roberts and Tae Kwon Do Killer Bees Sensei Gareth Smith joined forces for the fourth year running to bring together martial artists across various disciplines to train together. This year would be the biggest and best yet, with some incredibly talented people agreeing to come and share their knowledge with our little corner of the world. 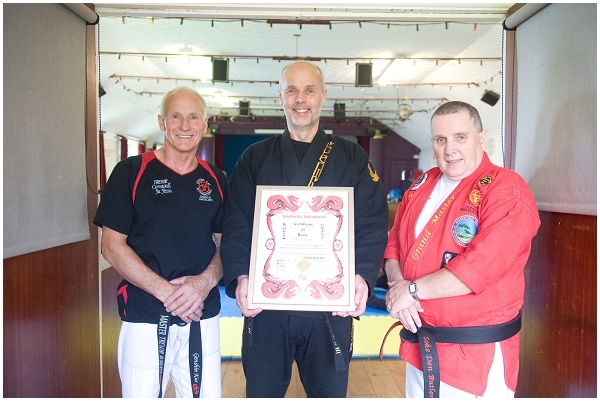 Kicking off our weekend of training was Master Clive Harrison – a Tae Kwon Do 8th Dan who has over 40 years experience in martial arts and has helped over 400 students achieve their black belt. 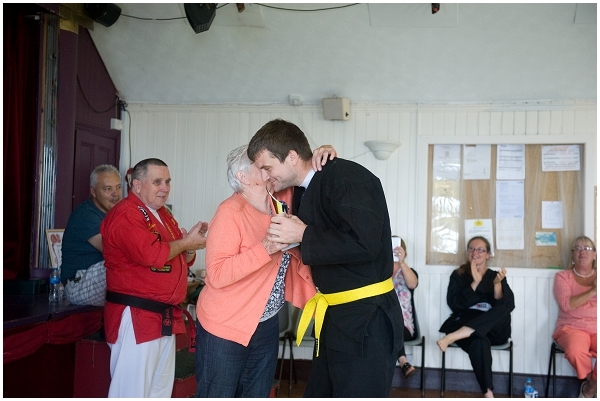 Clive and his wife Rachel have supported every summer camp to date, and always manage to bring something new to the mat. 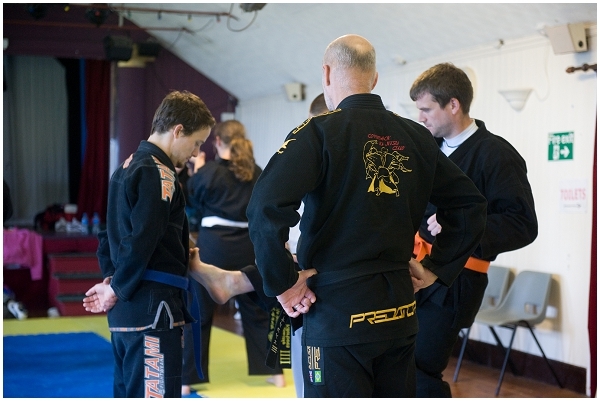 They’re a much respected part of the Coverack Ju Jitsu family and we thank them so much for their ongoing support. 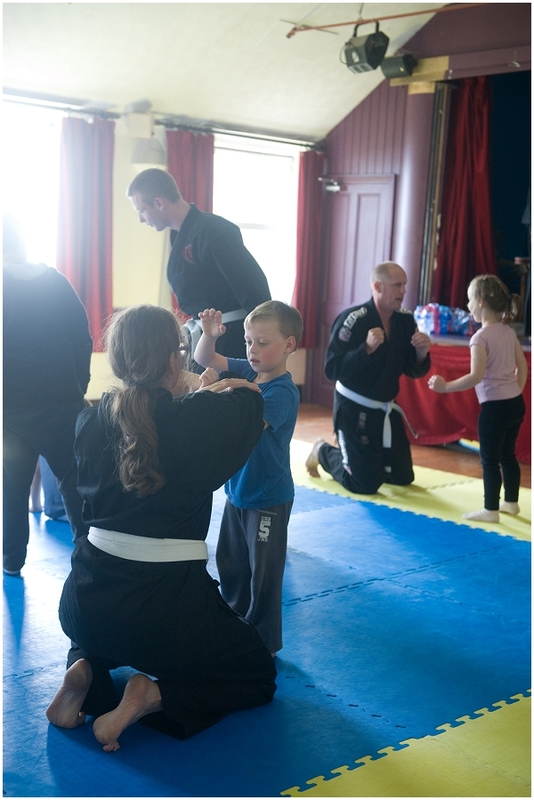 The sun was shining so training took place on the grass at Coverack Ju Jitsu dojo. 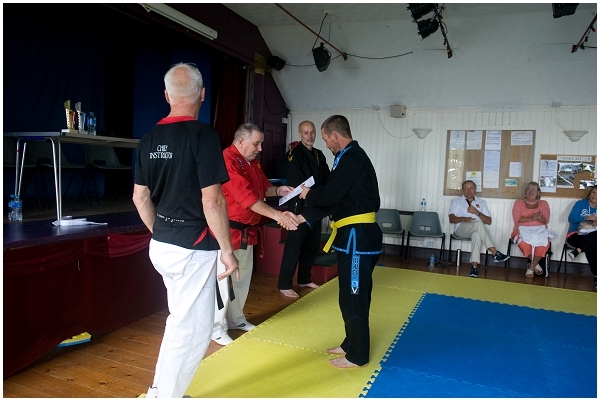 On Saturday morning, Coverack Ju Jitsu Master Trevor Roberts took the mat with Grand Master Den Butler. 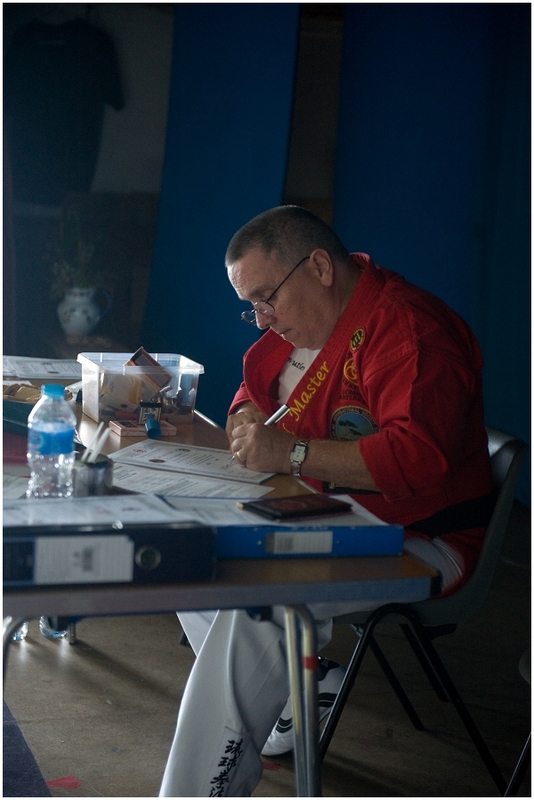 Grand Master Den Butler is a highly experienced martial artist with over 40 years training, starting out with Shotokan Karate and going on to train in Kodokan Judo, Goshin Jutsu, Iaido and Karate. I’ve been working with Den for over 30 years. My number 1 supporter and always there for the club! 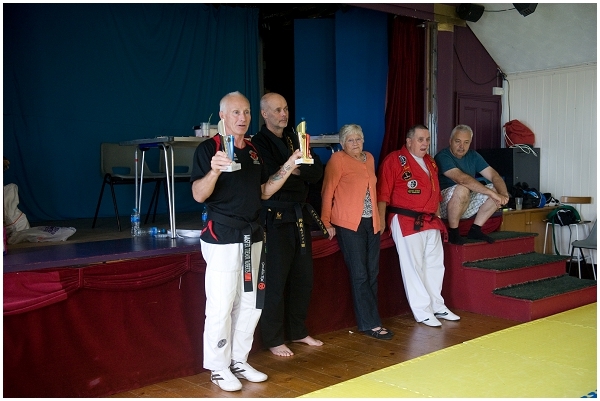 Muay Thai legends Pat Le Hoang and Ronnie Green were a huge part of this year’s summer camp – it’s hard to believe that such influential figures within martial arts could be so lacking in ego, so giving and so generous with their knowledge. 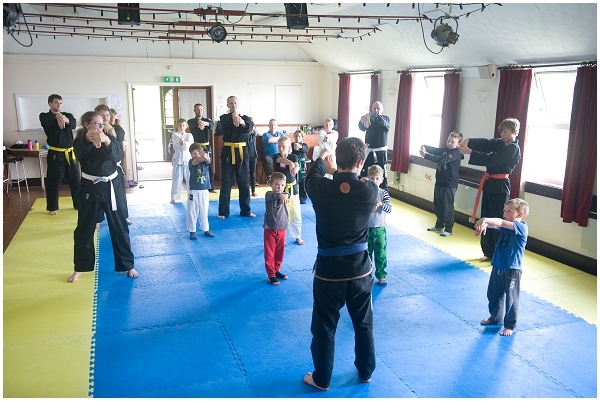 Their seminar had everyone completely in awe as they shared their insight into the gentle movement of Muay Thai, with Coach Le Hoang also doing some edged weapons work with the adults. 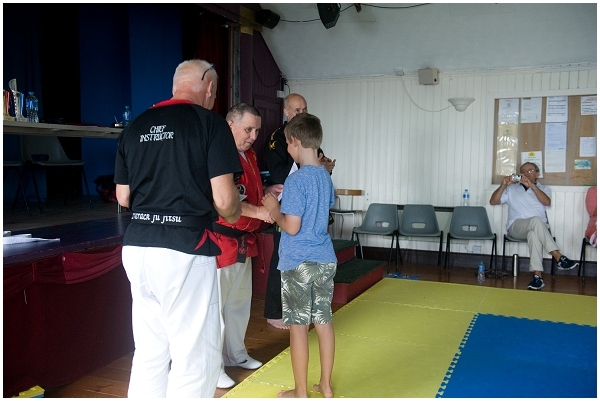 This was all a totally new experience to us here at Coverack Ju Jitsu and it was not only interesting to watch but an honour to have these martial arts greats sharing their knowledge with us. Not only did they show up for seminars though, but we were incredibly lucky to have these guys with us for the week. They mentored Master Roberts, stayed in his home and joined us all around the camp fire. 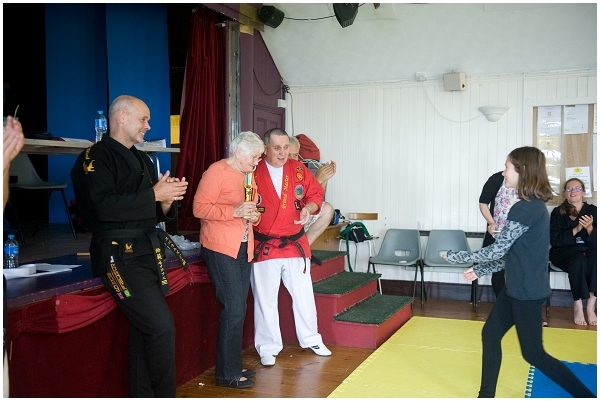 It’s hard to believe that such influential figures within martial arts could be so lacking ego, so giving and generous with their knowledge, but it made sense that with the gentleness of their art, they really fit in with the Cornish pace of life. We look forward to welcoming them both back for years to come – not just as ouststanding mentors, but much valued friends. I have a great working relationship with Raph and enjoy going along to support him with his competitions. We’re honoured to have his support of the club. A highly experienced Mixed Martial Arts (MMA) fighter, Mark Weir has been ranked number 1 in the country since 1999 and is described as being ‘the most experienced active fighter in the UK’. What more can you add to that?! Mark is always supportive of summer camps and willing to share his skills – his enthusiasm is infectious and we can never get enough! I hope this has given you a bit of a flavour of what goes on at summer camp. It’s a brilliant few days bringing together an awesome bunch of people. 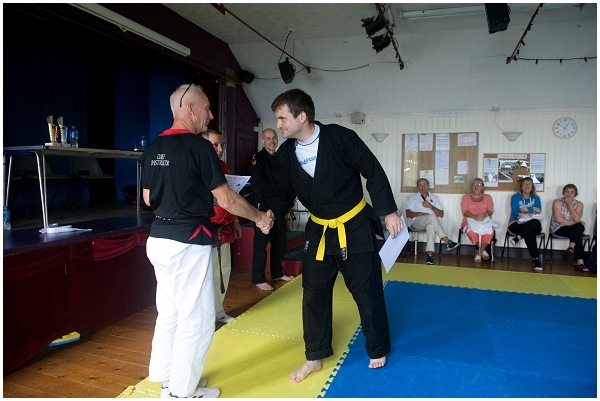 As a club we’re always committed to building mutually beneficial relationships with other clubs. 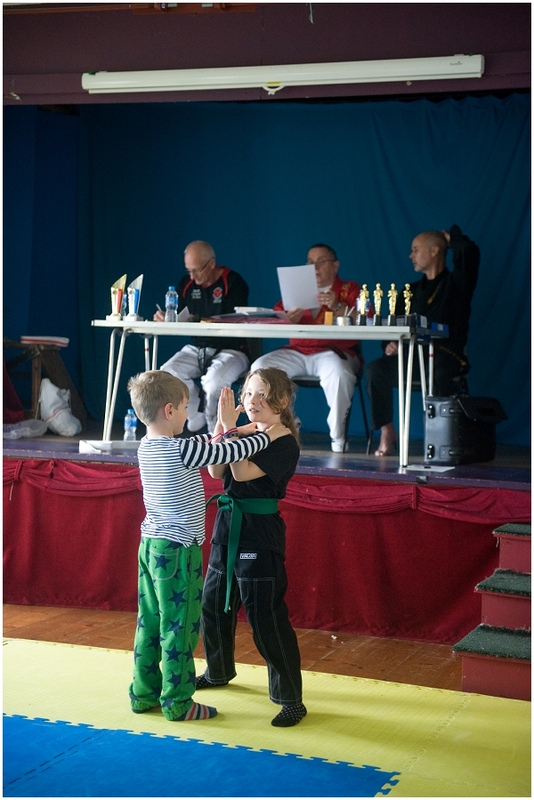 Sharing our knowledge and opening our minds to other disciplines is so valuable in our own individual martial arts journeys. We are always amazed and thankful for the others out their who share our way of thinking. It’s a pleasure to know and work with you all. A special shout out too for Andy and Emma Tylor who went all out to give us a brilliant camping location AND the best BBQ in Cornwall! 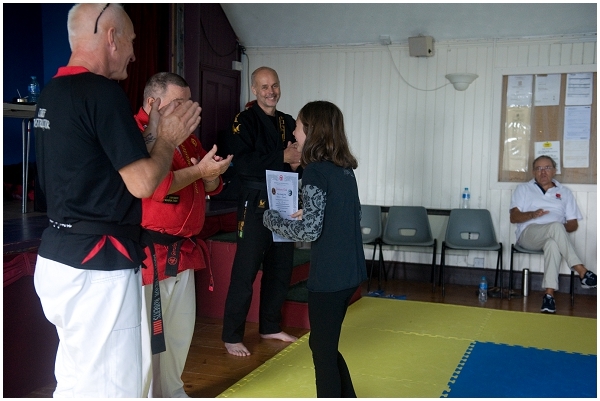 Finally, I can’t let this roundup go out without a big up to Sensei Gareth Smith – a fantastic martial artist and awesome friend. Our clubs work hand in hand, we support each other, train together and he even runs the club when I’m away! 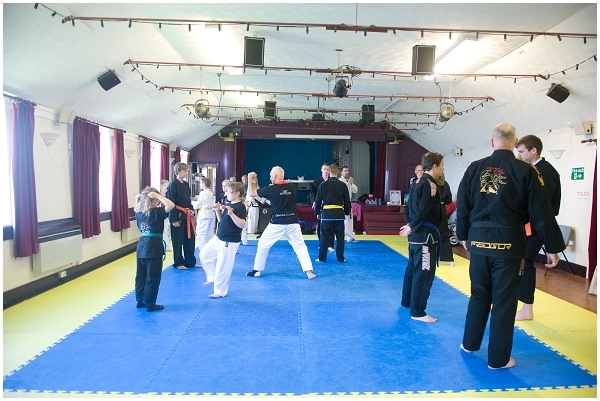 If this has whet your appetite and you’re keen to get involved, fear not – plans for our 2018 martial arts get together are taking shape and looking amazing! Keep your eye out for info as it becomes available – head over and hit like on our facebook page. Summer camp is fast approaching, and it promises to be an amazing event. 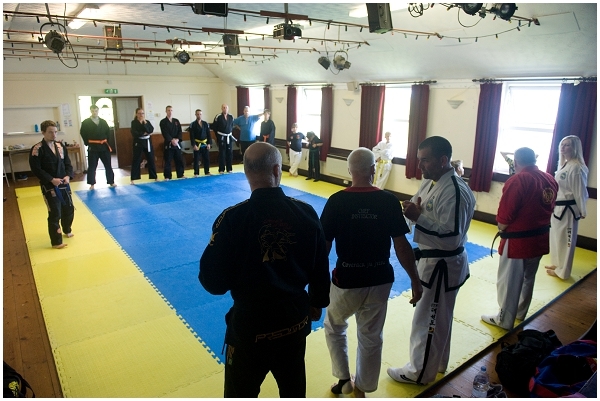 With some of the top names across the martial arts world, this is an opportunity for all martial artists across all disciplines to take seminars with our incredible line up. You can now buy your tickets over at the main summer camp page – limited availability and first come first served. Do NOT miss out! As a club we love nothing more than the opportunity to train across disciplines. 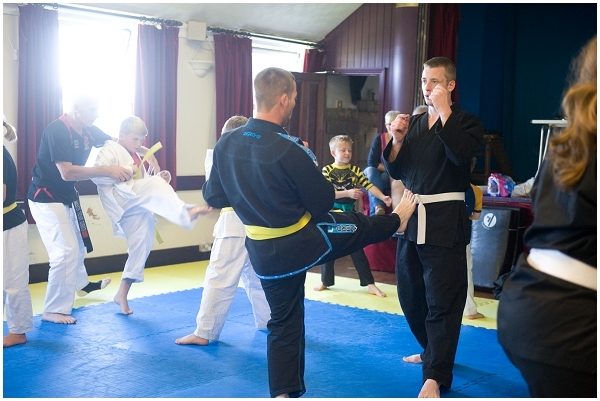 We regularly welcome our friends Sensei Gareth Smith and the Tae Kwon Do Killer Bees to our Coverack dojo, and it’s these guys we work with to bring you the Summer Camp each year. Sensei Gareth Smith joined us this week for training, bringing with him samples of the t-shirts we’ll be giving to everyone who comes along to this year’s Summer Camp. We took a bit of a vote on colour preferences and it was pretty evenly split, so we reckon we’ll have to do some of each! If you haven’t checked out the Summer Camp info yet, you can find it here. This year’s event is shaping up to be the biggest and best yet. 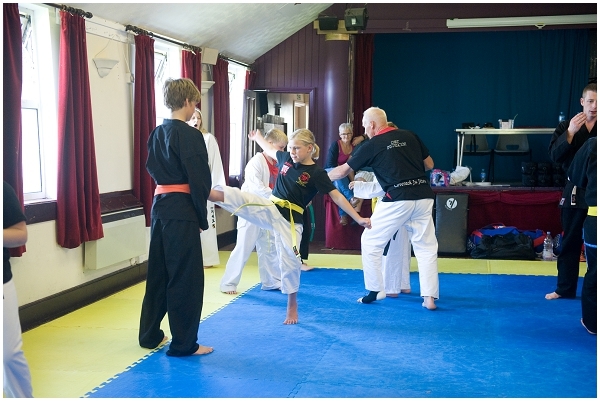 The camp will take place right here in Coverack and we’ve got some really big names from the world of martial arts. With camping available for the full week, bring family/friends and make a real break of it. Not a bad view for your training either…! We’re hoping to set up online ticket purchasing, but in the meantime just drop Trevor or Gareth a line if you want to come along to what promises to be a brilliant event. 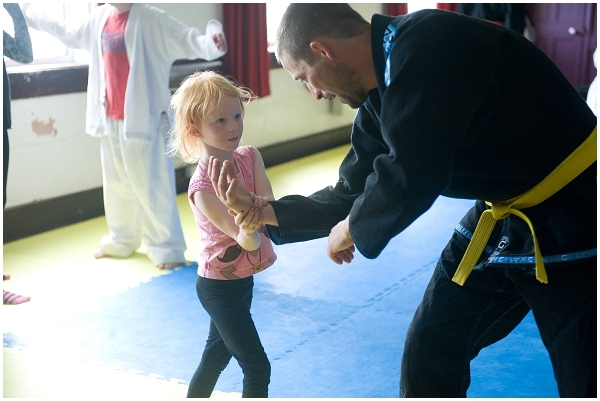 Exciting things are afoot at Coverack Ju Jitsu HQ, with plans taking shape for what’s set to be our best Summer Camp yet! 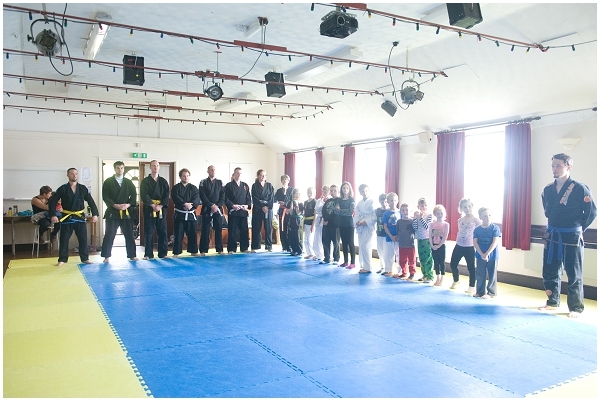 Hosted by Coverack Ju Jitsu Club in our home village of Coverack, the event which is being organised in collaboration with Sensei Gareth Smith at the Tae Kwon Do Killer Bees, will take place this August. 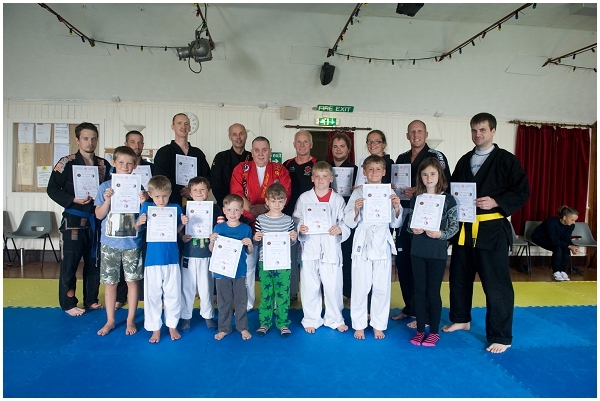 This Thursday (17th December) will be our last class of 2015 – we’ll be back again on Thursday 7th January 2016. If we don’t see you this week, have a brilliant Christmas and new year. 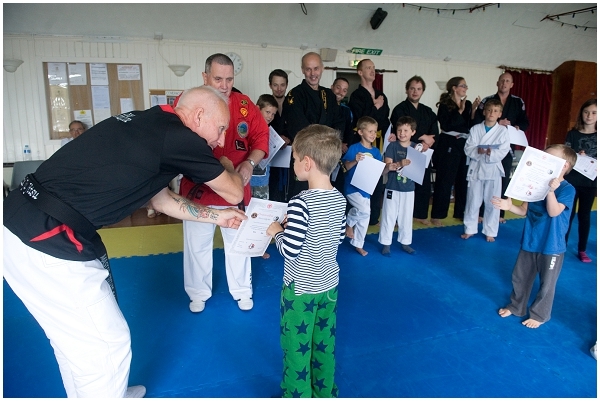 This weekend, Coverack Ju Jitsu welcomed Grand Master Den Butler for a couple of days of grading, training and teaching, along with Sensei Gareth Smith from St Austell’s Tae Kwon Do Killer Bees. 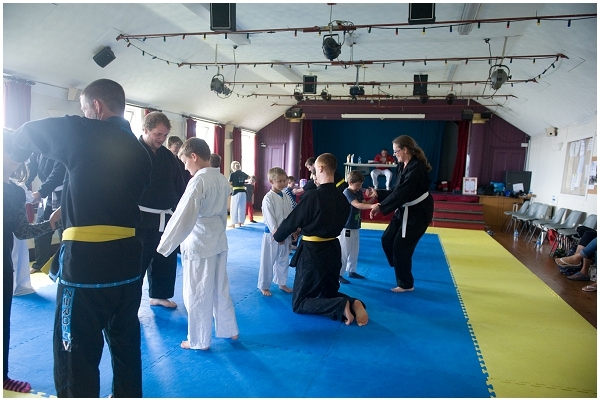 The club saw 15 members achieve belt gradings on Saturday morning, 8 juniors (including 3 ‘Little Ninjas’)and 8 seniors climbing the ranks after demonstrating their knowledge. 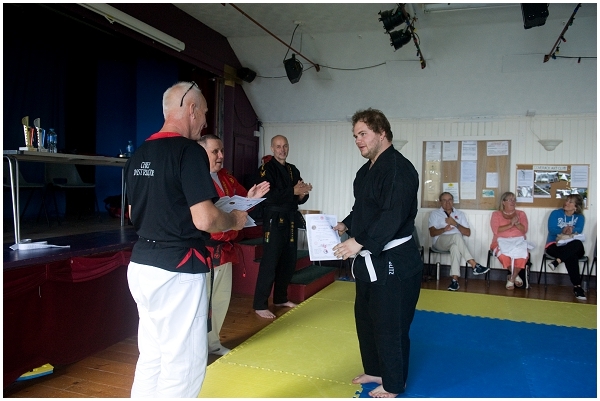 Ricky Williams – for your well deserved 4th Dan. 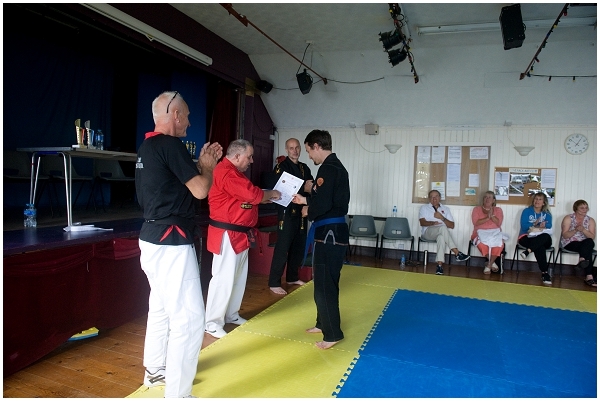 Adam Cooper – for achieving your 3rd Dan, much deserved. 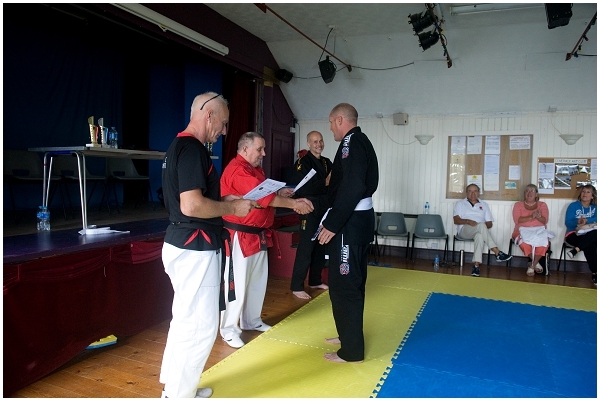 Terry Stidworthy – who received a surprise promotion to purple belt by Grand Master Den Butler. 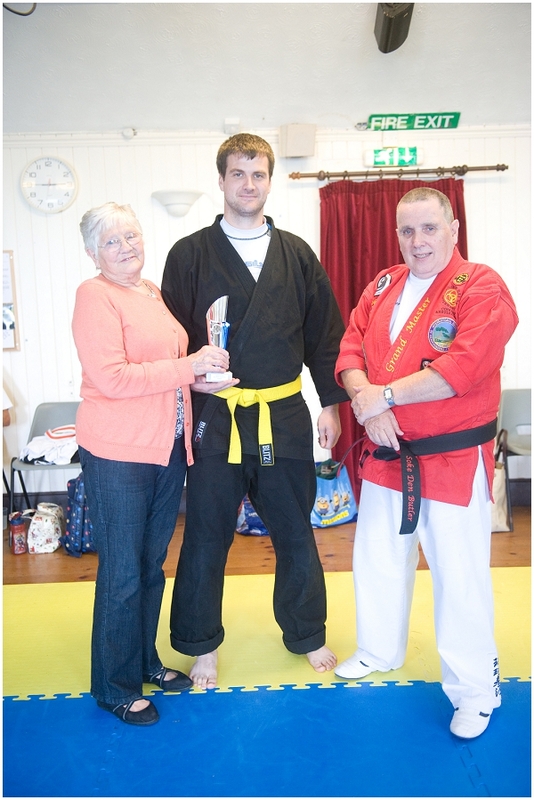 A rare accolade, awarded personlly by Den to Terry for being a student who particularly stands out and contributes such a lot to the club. 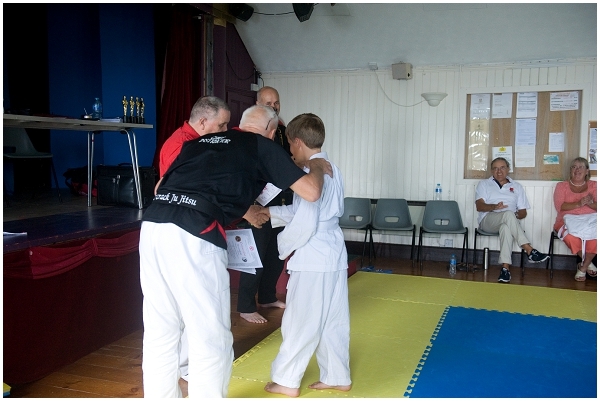 Jack Wood – who was promoted to orange belt but with a white stripe, signifying how very close he is to reaching the next level of achievement. 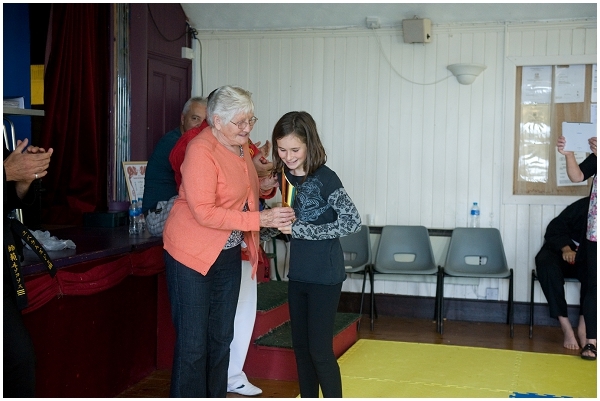 An excellent student showing much promise at just 7 years old. 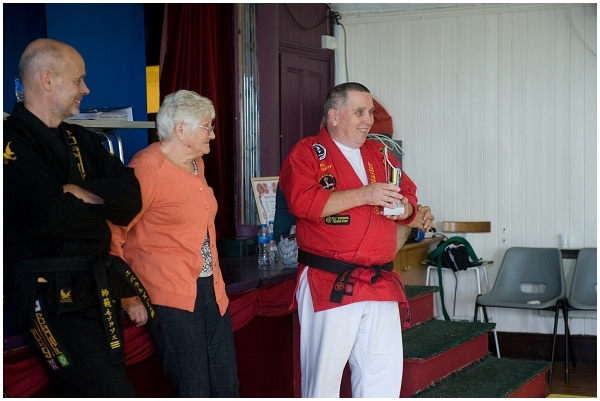 Grand Master Den Butler presented the club with two new trophies. 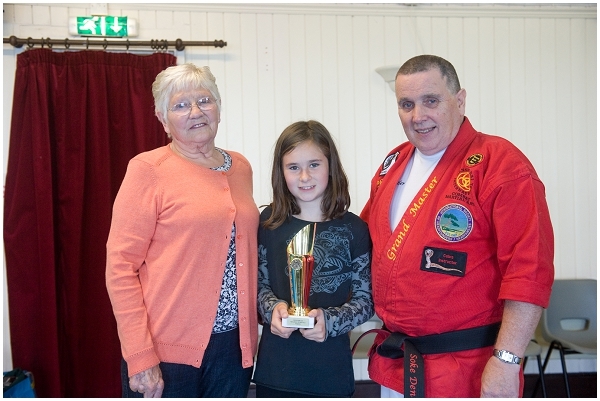 These will be awarded in memory of Master Roberts’ Dad, Maurice, who sadly passed away last year. 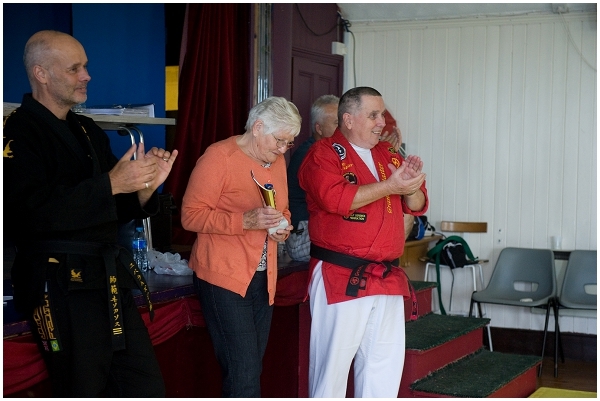 As Master Roberts fondly explained: “My Dad wasn’t very good at ju jitsu, but he loved hearing about what I was up to, and coming along to watch, and he was always pleased to see people doing well”. 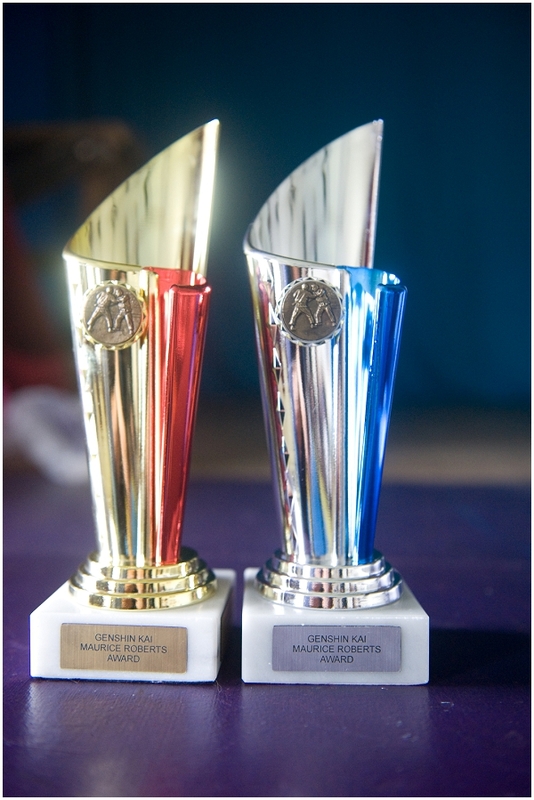 These two awards will be presented every 3 months, recognising special efforts made by deserving members. A very well done to you both. After a busy morning of training, students tucked into a hearty lunch to replenish their energy (thanks Liz Jenkins! ), before spending an afternoon training. 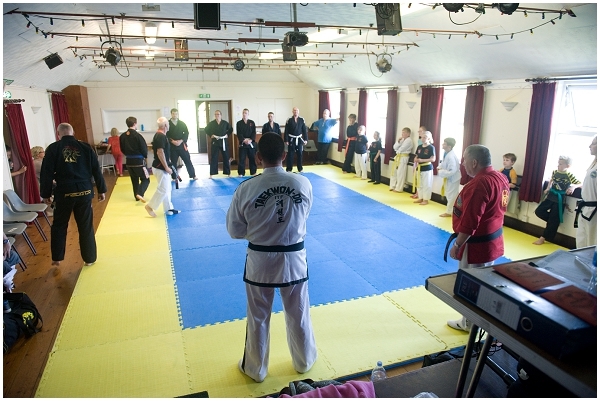 An hour with 10th Dan Grand Master Den Butler sharing his awesome knowledge, followed by training with the St Austell based Tae Kwon Do club lead by Sensei Gareth Smith. 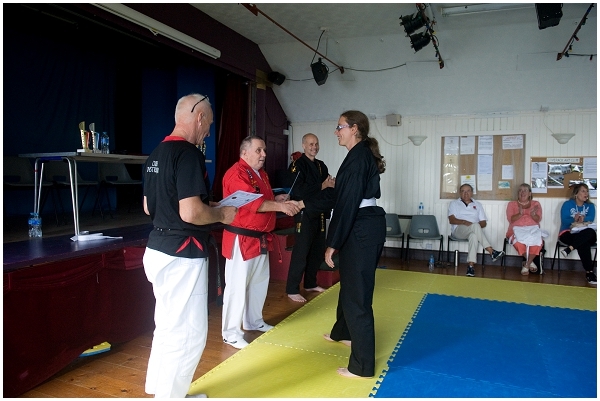 Den – thank you for travelling all the way down from Wiltshire, for giving up so much personal time to help with the grading, sharing your knowledge and your neverending support for the club. 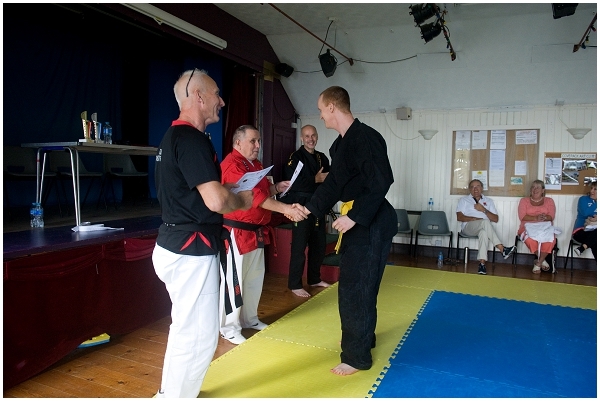 Gareth – thank you once again for helping to expand our students minds with multi-genre training. 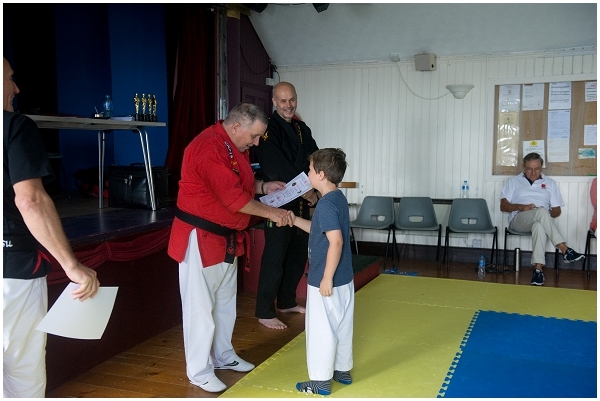 It’s always great welcoming you to Coverack Ju Jitsu dojo, we all really appreciate your time and effort. 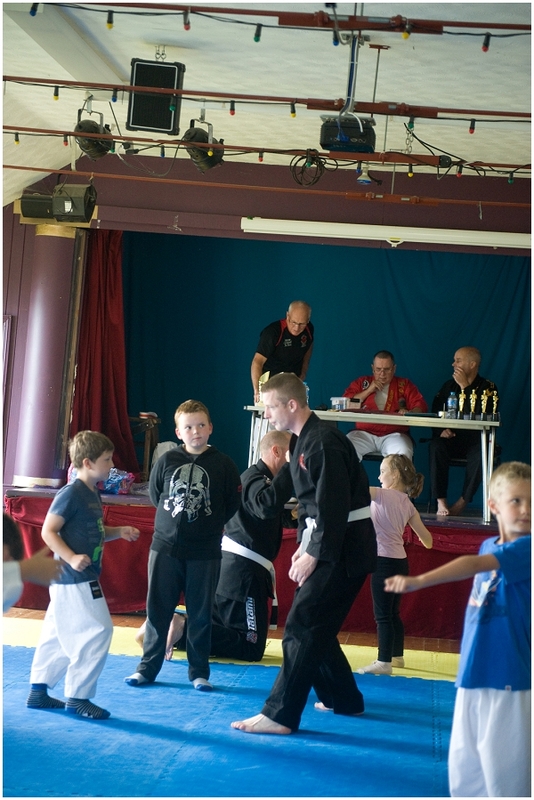 Ricky and Adam – our club black belts, whose support and commitment is unwaivering and always appreciated. Thank you! Club students – without you, we’d have no club! For always turning up, for paying attention, training hard and doing your best. You really did us proud this weekend! 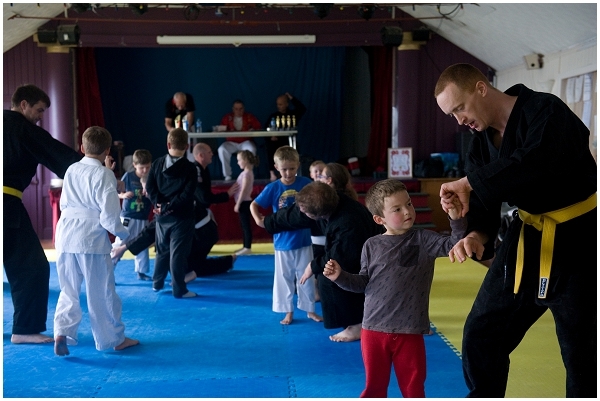 Our little ju jitsu club might be tucked away in a little village dojo by the sea, but we’re achieving awesome things. Both Den and Gareth have had so many good things to say about what we’re doing and achieving. You should all be so proud of yourselves. Donna Sharpe – my niece, for your ongoing support of the club by managing our website, updating our facebook page and being official photographer at many of our events. 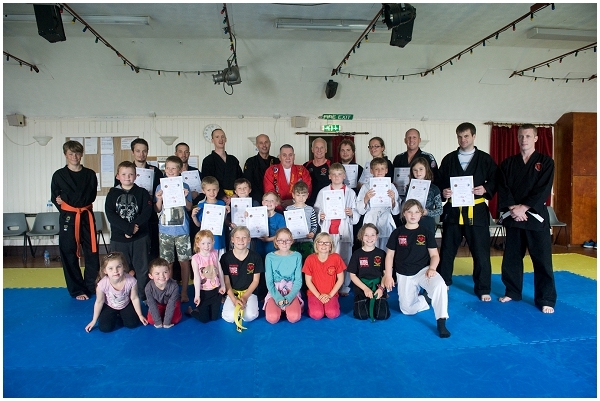 The club saw 15 members achieve belt gradings on Saturday morning, 8 juniors and 7 seniors climbing the ranks after demonstrating their knowledge. 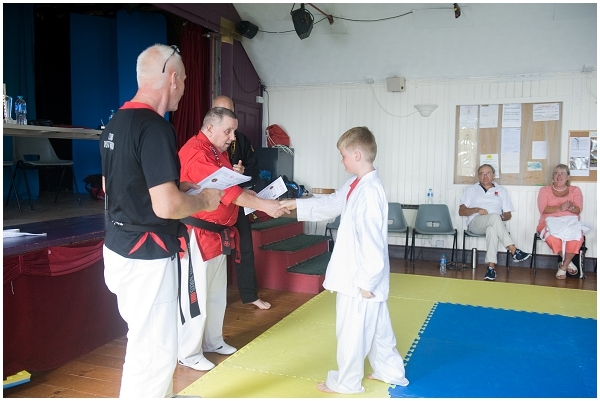 Jack Wood – who was promoted to orange belt but with a white stripe, signifying how very close he is to reaching the next level of achievement. 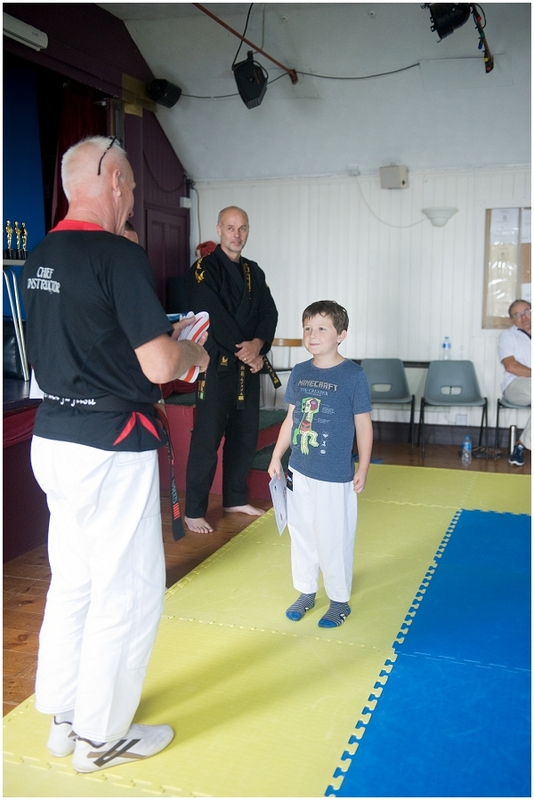 An excellent student showing much promise at just 6 years old. The club is back to full speed after our summer break, and we’re kicking off the autumn season with an exciting weekend of training ahead. We invite both students and members of the public to join us (at no charge), at the Lambeage Hall in Coverack for a packed schedule (see below). 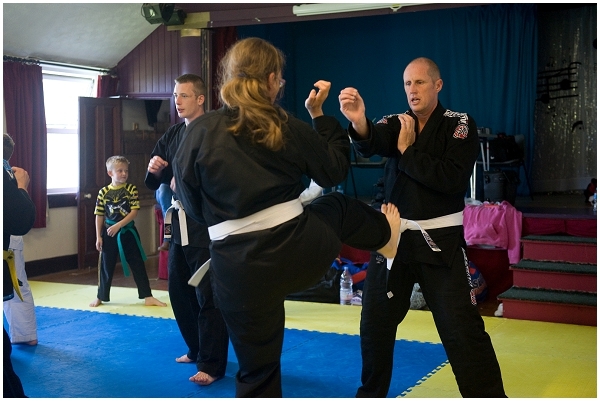 We will be welcoming 10th Dan Grand Master Butler (Genshin Kai) and 4th Dan Sensei Gareth Smith (TaeKwonDo Killer Bees) to the Coverack Ju-Jitsu dojo to join 6th Dan Master Trevor Roberts and 3rd Dan Sensei Ricky Williams for a couple of days training, grading and award giving. 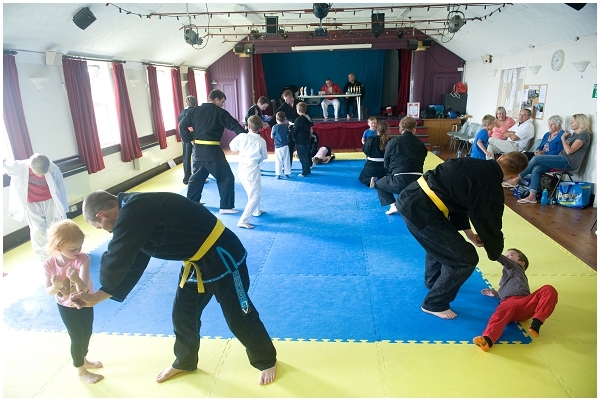 We’d love to see as many students as possible over the weekend (feel free to drop in and out as it suits you, but would love to see you at 10am on Saturday for grading). We’d also love to welcome the public to drop in and watch during the afternoon sessions – see the schedule below for more info, all items marked with a ** are open to the public. If the weather is nice we’ll be training outside. (Senior club members are welcome to join us on Saturday evening for a drink/food at the pub). 9.30am – be at hall for 9.30am start.